In this video, Sarah Harkin explains how you can help bee colonies or other pollinators. Bee species and other pollinators are crucial for optimizing crop yields and healthy germination, so the decline of bees worldwide has been alarming to conservationists and agriculturalists. Nevertheless, as Harkin explains, protection of bees can be achieved through everything from governmental policies to individual actions. Sarah specializes in bee ecotoxicology (honey bee and non-apis species), working on lab-based, field and semi-field studies. She is an active member of the working groups that form The International Commission for Pollinator Plant Relationships (ICPPR). 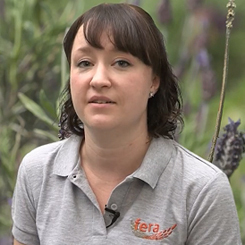 Sarah also manages the Bee Team at Fera and is responsible for the successful delivery of bee-related projects.